What to do with a smallish scrap of pastry? I had some left after making Isabella’s pesto tomato tarts the other week, but it wasn’t really enough to make anything too substantial – definitely not enough for a mushroom wellington or a batch of sausage rolls. 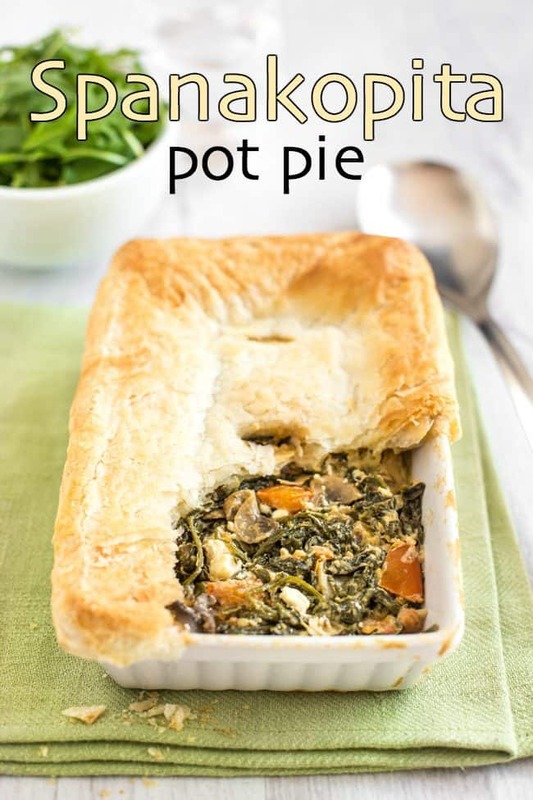 Pot pie is a great solution! 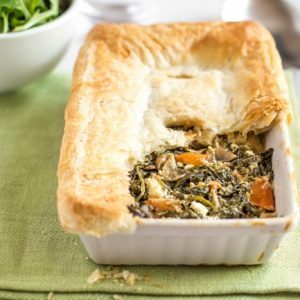 It only has a crust on top, not underneath, so you only really need a scrap of pastry big enough to cover your dish – and since I only made a fairly small pot pie (two portions), I didn’t need much. It’s a much better solution than wasting that last scrap. 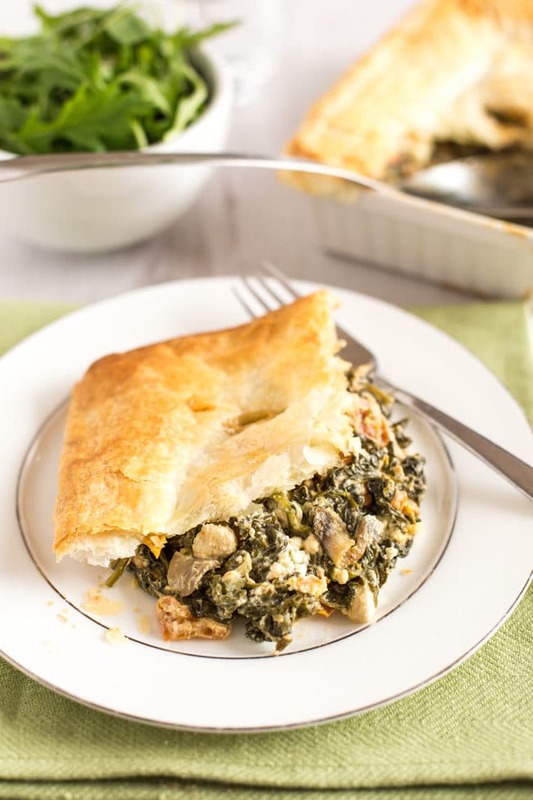 You can fill a pot pie with any number of fillings – this time I made a spanakopita pot pie! If you’re not familiar with spanakopita, it’s a Greek dish made with spinach and feta cheese, and it’s one of my all-time favourites (to be honest, most Greek food is pretty amazing). This time I added some mushrooms and tomatoes to the mixture as well, just for an extra bit of colour and flavour. Never any harm in adding extra veg! It’s still not the most beautiful mixture in the world (try to look past its appearance…), but it tastes seriously good with all that creamy, salty feta. 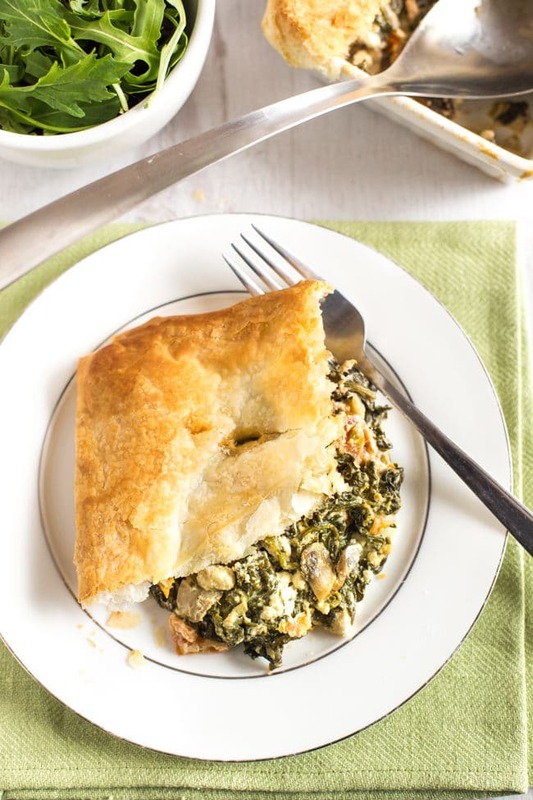 Spanakopita is usually cooked in layers or bundles of filo pastry, but I suppose this spanakopita pot pie is a bit of a lazy version. Once you’ve prepared the spinach mixture, just pop it in a baking dish, and lay your scrap of pastry over the top. No faffing involved – just my kind of recipe. If you have a bit more pastry to spare, feel free to double or triple the recipe to make a family-sized pie. This little version happily fed me and my husband, but it would be really easy to scale up if you have more hungry bellies to fill. 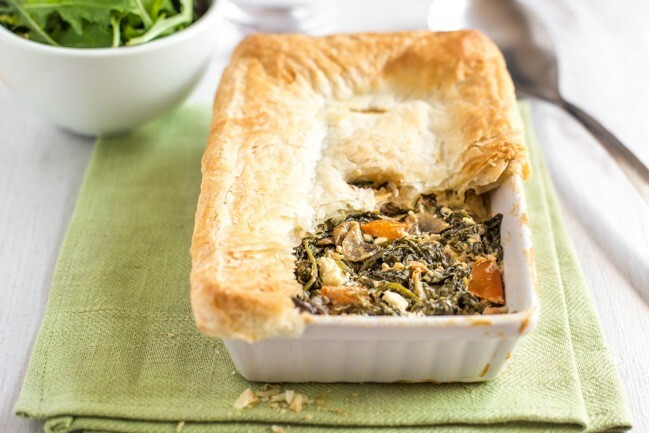 Just serve it alongside some salad or extra veggies, potatoes, garlic bread… whatever you fancy. It’ll be a winner however it’s served. 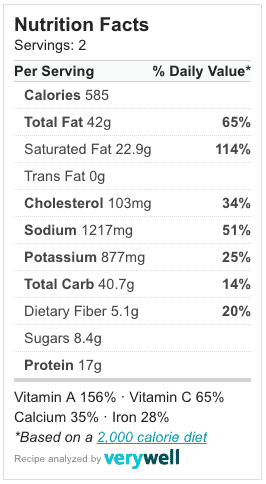 Heat the oil in a large frying pan, and add the sliced mushrooms. Cook over a medium heat for a couple of minutes, until slightly soft. Add the minced garlic, diced tomatoes, sliced spring onions and as much of the spinach as you can comfortably fit in the pan. Cook for a few more minutes, stirring regularly, until the spinach has mostly wilted. Add the remaining spinach, and again cook until wilted. Add the cream cheese and crumbled feta, and season with a generous amount of black pepper. Mix well to combine, allowing the cream cheese to melt into the spinach mixture. Transfer the mixture to a small baking dish. Lay the puff pastry over the top, and press it down securely over the edges of the dish. Trim any extreme excess, leaving about 1cm overhanging the edge of the dish on all sides. Cut a few small slits in the top of the pie, and brush lightly with milk. Bake the pie for around 25 minutes, or until the pastry top is golden brown and crispy. Still got a few scraps of pastry left over? Make my cheesy asparagus straws! Fab, thanks so much Annie! I made this last night and it was SO GOOD! If I make it again, I want to double the filling, but man – this was almost as good as my gf’s YiaYia’s spanakopita. I don’t care what it looks like if it tastes good! This looks yummy and I bet it tastes delicious – what a great tweak on a classic.